We search the world marketplace for the best products and prices every day along with unique offerings to the consumer. Products are constantly changing so please check back often. We offer local pickup, shipping by Canada Post in Canada and USPS internationally. FREE SHIPPING IN CANADA WITH ORDERS OVER $200.00! The Military Surplus MOLLE II Entrenching Tool Carrier fits perfectly over military issue entrenching tools. 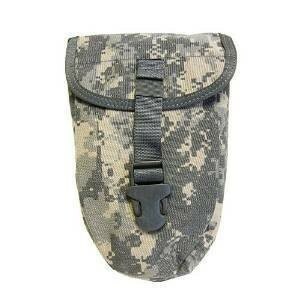 The carrier comes with two MOLLE straps on the back making it easy to strap onto a load bearing vest, belt, or pack. There is a metal grommet at the bottom for draining liquid out of the carrier. The quick release buckle allows the Entrenching Tool to be accessed easily while still securing it firmly during travel. The sides of the carrier are reinforced in addition to the durable Cordrua fabric that keeps the blade of the Entrenching Tool from cutting into the fabric. GearTrade was founded in 2012 in Okotoks, Alberta by an outdoor enthusiast and entrepreneur who saw a need for an outdoor gear marketplace. Over the years, this local based business flourished with online sales throughout North America through online platforms. With that being said, it’s still the little touches that matter to us. We strive to take the time needed to make sure our customers walk away with the right product for their next adventure. 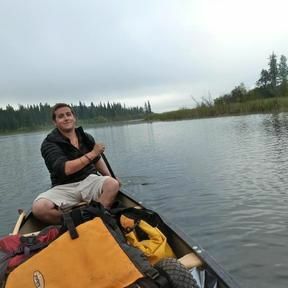 With a degree in Eco Tourism and Outdoor Leadership, Owner and operator Jesse Hebenton has an extensive background in the outdoor field both in retail and as a guide and outdoor facilitator. But at the end of the day let’s face it, he’s a big time gear junkie. Our mission has been and continues to be simple, we want to continue to provide outdoor enthusiasts with the best marketplace to buy brand name and high quality gear at wholesale prices year round. Please call for professional outfitting - we thrive on personalized relationships. By appointment only - please feel free to call, text or email Jesse at 403.604.4227 to set up your private backpack fitting or time needed to find the right gear.